The American Association of Orthodontists recommends that a child receive his or her first orthodontic examination by age 7. Early diagnosis and treatment can correct small problems before they become big problems. Signs of potential orthodontic problems may not be obvious. Our initial exams are free and are important to ensure proper oral health. 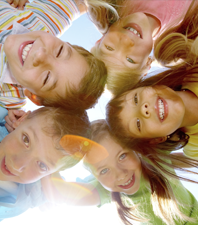 Some children can benefit from interceptive orthodontic treatment. Interceptive care refers to orthodontic treatment at an age before all of the permanent teeth have erupted. This typically occurs between the ages of 8 and 10. We can correct major problems including crossbites or severe skeletal structural issues, as well as crowding and crooked teeth. Early treatment can make subsequent orthodontic treatment more productive and enable better results. Orthodontics is more than straightening crooked teeth. Proper tooth and jaw alignment is critical to maintaining long-term oral health. We believe that orthodontic treatment during adolescent growth provides the greatest opportunity to achieve the best possible treatment result. Orthodontic treatment can be rewarding to our adult patients. Adult patients tend to be highly motivated. Highly motivated patients achieve excellent treatment results. Teeth provide the support structure for the soft tissue of the lower face, especially the lips and cheeks. Ideal tooth alignment can improve facial esthetics. We can often achieve greater facial esthetics without surgery or extractions by creating a treatment plan utilizing appliances that can expand the jaw and realign teeth and gums.